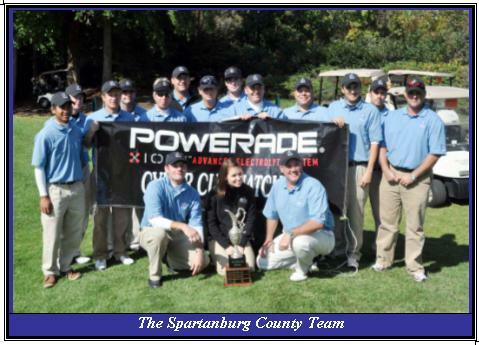 The 2009 Powerade Cyder Cup Matches tilted back to Spartanburg Sunday at River Falls Plantation when Spartanburg Captain Brian Kennedy's team won five of the first six matches en route to an 18-14 victory for the three rounds of golf over two days. Greenville, who won the Cup last year, took a 5-3 lead in Saturday morning's best ball matches, but the Spartanburg team rallied in the afternoon's alternate shot format to take a 9-7 lead over Greenville, who were led by Captain Tommy Ashworth. They would match that 9-7 edge in Sunday's 16 singles matches to pull away for the four point victory. Spartanburg now holds a 4-2 advantage in the event, which has completed it's 6th year. Greenville Team Tournament Director David Holtzclaw announced that the two teams had raised over $33,000 in donations for The First Tee programs of Greenville & Spartanburg counties. 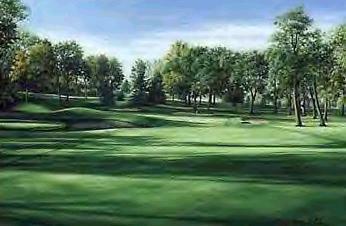 There will be a clinic at River Falls on Thursday afternoon, October 22 at 5:30 for kids from The First Tee. Thank you to everyone who participated in any way in this fantastic event. Congratulations to Team Spartanburg in winning the 2009 Powerade Cyder Cup! CLICK HERE FOR FINAL RESULTS and the 2009 POWERADE CYDER CUP PAGE! For half the day, it looked like Greenville County was still riding the momentum from last year's 22-10 victory that re-claimed the Powerade Cyder Cup. The first eight matches of the day saw Greenville win three matches, four were halved, and Spartanburg won one. That gave Greenville a 5-3 lead after the Two Man Best Ball format. But Spartanburg turned the tables in the afternoon round, an alternate shot format. They won six of the afternoon's eight points and hold a 9-7 overall lead going into the final round Sunday morning. There are 16 points available, as all sixteen players from each team will go head to head in singles matches. Greenville needs 16 points to retain the Cup, while Spartanburg will need 16 1/2 to take it home. Come out to River Falls Plantation Sunday, as the first match begins at 7:50 AM. There is no admission to see some of the best golfers in the Upstate compete to decide the Powerade Cyder Cup. After the completion of play, the two teams will present a check to The First Tee programs of Greenville & Spartanburg Counties. The players of both teams have raised support over the last several weeks to support this worthly cause. 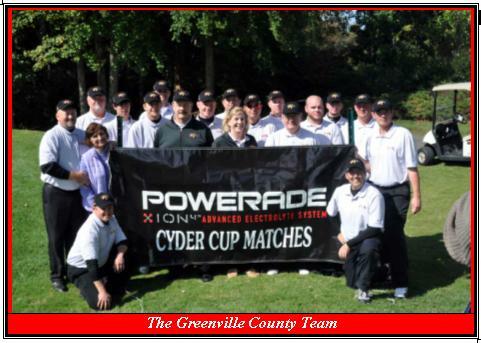 The 2009 Powerade Cyder Cup Matches are all set to go this weekend at River Falls Plantation. Last year the Greenville team won going away by a 22-9 total, but Spartanburg still leads the event's relatively young history at 3-2. Greenville Captain Tommy Ashworth says he has another good team, but that Spartanburg will be more than formidable. "Oh yes, they are really, really good players over there. We have a good team, and we are a pretty close-knit group, but if we don't play our very best, they are very capable to just turn it around on us." Greenville is headlined by Marcus Grumbles, who just this past weekend, rallied from eight shots behind with a sizzling 65 to win the SCGA's State Mid-Amateur Championship with a three day total of ten under par. Spartanburg, meanwhile can boast about team member Kyle Milner, who finished a shot behind Grumbles, and recently qualified and played in the US Mid-Amateur Championship at Kiawah Island. Spartanburg is captained by multiple time Powerade Cyder Cup player Brian Kennedy. In addition to the competition, the event serves to help raise much needed funds for The First Tee programs of Greenville and Spartanburg Counties. This is a truly wonderful organization that we are proud to assist and promote. If you or your business would be interested in joining the Greenville or Spartanburg team in donating to this worthwhile organization, please contact us! The first tee time Saturday morning is 7:40 AM for the morning matches, which will be Two Man Best Ball format. The afternoon matches will be re-paired and a Two Man Alternate Shot (Foursomes) format will tee off at approximately 1:00 PM. On Sunday morning, there will be 16 singles matches, featuring head-to-head match play that will ultimately decide who holds posession of the Powerade Cyder Cup for the next year. The event is open to the public and there is no admission to come out and watch some of the best golfers in the Upstate compete. The 2009 Powerade Cyder Cup teams have been announced by their captains - Tommy Ashworth (Greenville) and Brian Kennedy(Spartanburg). 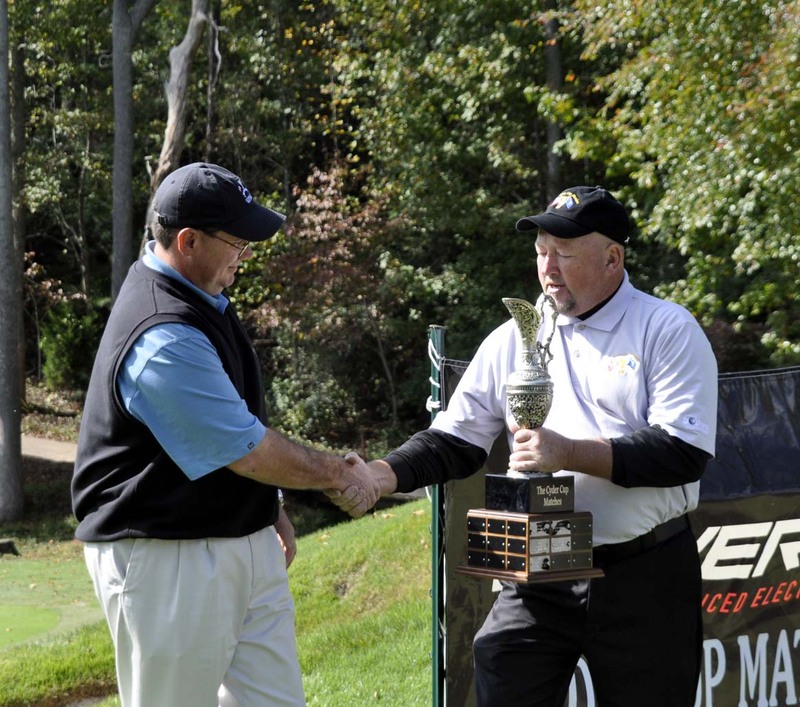 The Cyder Cup matches will take place at River Falls Plantation on October 17-18, 2009. This is the sixth year of this event and Spartanburg County holds a 3-2 lead over Greenville County.